pi - The ratio of a circles circumference to its diameter. In the 3rd century Archimedes approximated a circle by a 96 sided polygon and determined that 3 + 10/71 < pi < 3 + 1/7. 666/212 is correct to 4 decimal places. 355/113 is correct to 6 decimal places. 104348/33215 is correct to 8 decimal places. The following is attributed to the English mathematician John Wallis in 1655. And this one by the Swiss mathematician Leonard Euler. Some more involved expansions are given below. If a needle of unit length is randomly thrown onto a plane which is covered with parallel lines 1 unit apart the probability that the needle will intersect a line is 2/pi. Break a line segment into two such that the ratio of the whole to the longest segment is the same as the ratio of the two segments. From the diagram below. The condition can expressed as a/b = 1/a. This can be rearranged and expressed as a quadratic. This is the original Greek definition, often phi-1 is used instead. This tends to phi as i tends to infinity. That is, the ratio of consecutive terms in such a series approaches phi, this is true independent of the starting points of the series. The zero order series starts with 1 and 1 as below. The ratio of terms of this series as converged to 3 decimal places after only 10 terms. An alternative definition which is the 2D version of the original definition based on the line segment is: "find a rectangle such that when a square is removed the remaining rectangle has the same proportions as the original". The solution to this is a rectangle with the ratio of its sides being phi. These rectangles can be inscribed in a so called logarithmic spiral also known as equiangular spirals. Such spirals and occur frequently in nature, for example: shells, sunflowers, and pine cones. The limit point of the spiral is called the "eye of God". Note: the terms of the series describe a 1,phi Fibonacci sequence. The ancient Sumerian mathematics was based upon a weird mixture of base 6 and 10. In our decimal system a number is decomposed into multiples of powers of ten. In the general case one finds solutions for the ai coefficients so that following sum equals the number in question. Arithmetic in other bases follows the same system, for example, in base 6 a number is represented as follows. Unlike the general case which can be used to represent any number no matter how large, the Sumerian system stopped at 12960000. Indeed this was a highly significant number to them, similar to our infinity. Add up all the odd numbers from 1 while the sum is less than or equal to the number whose square root is being sought. The number of odd numbers needed is the square root. This method appears to work for as many decimal places as you wish to carry it out. I have no clue as to why this appears to work. The happy status of a number is determined by repeatedly replacing the number by the sum of the square of its digits. If this sequence ends in a 1 then the number is said to be happy, if it never reaches 1 it is unhappy. There are a few obvious things to be noted from the definition. For example, the order of the digits does not matter, so since 9908 is happy then so is 8099, 998, 989, 899, 9809, 9089. Also, zeros don't play any part in the happiness. So since 9001 is happy, so is 901, 109, 19, 91. It turns out that the sequence for all unhappy numbers falls into the attractor repeating sequences 4, 16, 37, 58, 89, 145, 42, 20. The concept can be extended to higher powers. The happy numbers (only 101 of them) under 10,000 for a third power are 1 10 100 112 121 211 778 787 877 1000 1012 1021 1102 1120 1189 1198 1201 1210 1234 1243 1324 1342 1423 1432 1579 1597 1759 1795 1819 1891 1918 1957 1975 1981 2011 2101 2110 2134 2143 2314 2341 2413 2431 2779 2797 2977 3124 3142 3214 3241 3412 3421 4123 4132 4213 4231 4312 4321 5179 5197 5719 5791 5917 5971 7078 7087 7159 7195 7279 7297 7519 7591 7708 7729 7780 7792 7807 7870 7915 7927 7951 7972 8077 8119 8191 8707 8770 8911 9118 9157 9175 9181 9277 9517 9571 9715 9727 9751 9772 9811 10000. In general as the power increases the frequency of happy numbers decreases. Another variation is to compute the lucky numbers for other bases, base 10 being used above. For base 2 and 4 all numbers are lucky, they are therefore called lucky bases. For base 3 the happy or unhappy status is the same as the even or odd status. A hazy prime of base "b" is a positive whole number that is not divisible (without remainder) by the first b prime numbers. The n'th hazy prime is denoted as Hb,n. 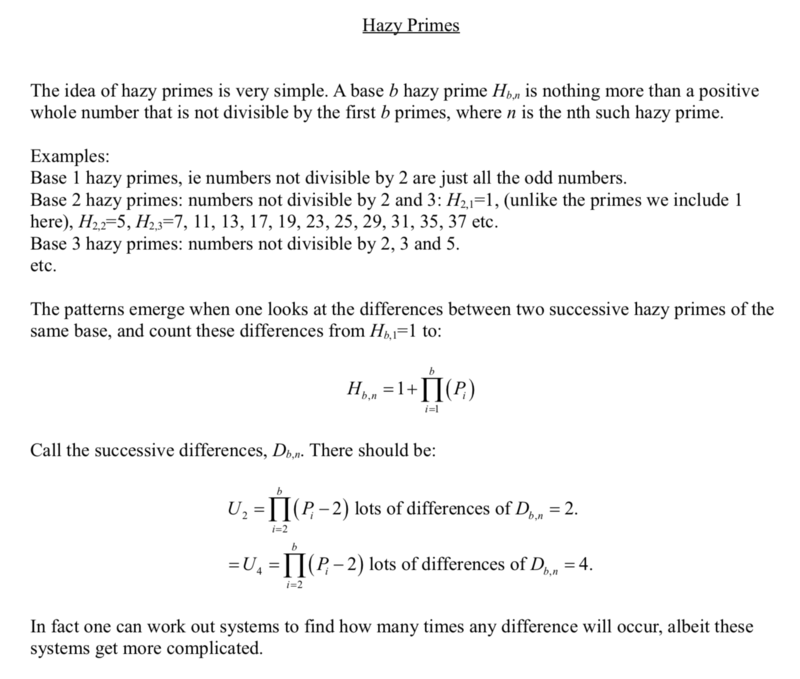 So for example the sequence of hazy primes H1,n are all the positive whole numbers not divisible by 2, namely the odd numbers. The sequence H2,n are all the positive whole numbers not divisible by 2 and 3. The sequence up to 100 being 1 5 7 11 13 17 19 23 25 29 31 35 37 41 43 47 49 53 55 59 61 65 67 71 73 77 79 83 85 89 91 95 97. The following table shows the base b on the vertical access and the hazy prime sequence on the horizontal axis. The base extends to 200 and the first 2000 items in the sequence shown. The red lines or spheres are primes.